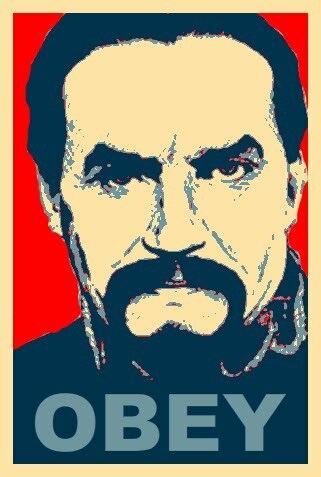 As you know, myself and the Prof are fans of Big Finish. I have to say that the Prof is far more versed in their productions than am I, seeing as I am still very much a happy dabbler rather than an aficionado. Its something I keep meaning to rectify and now the weather’s improving, I have determined to listen to a few on the walk to work of a morning (and evening, obviously; it’s not like I sleep there or anything, despite what my students might think). Now I’m not a fan of Peri; originally I only saw her in “The Caves of Androzani” (having given up on the show somewhere around Omega’s search for happy flapjacks in Amsterdam) and was not impressed. She was whiny and annoying and I couldn’t for the life of me figure out why everyone was determined to get themselves killed on her behalf. Nothing I’ve seen since has made me change my mind. So that makes this Companion Chronicle a bit of an odd choice then, really, doesn’t it? If it hadn’t been for the fact that Nev had written it and I’m a big fan of “Kingmaker” (no matter what my illustrious podcast companions might say, its fab), I freely admit that I would never have looked at this. 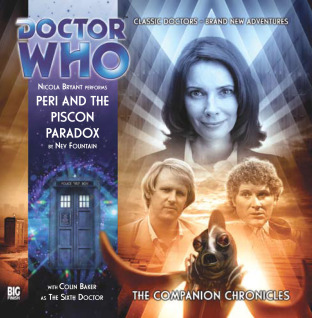 My dislike of the character did make the first disc difficult to get through despite the quality of the story, as Nev and Nicola Bryant have done far too good a job of catching young Peri’s voice. The Companion Chronicles rely on the person chosen to be able to pull off a reasonable impersonation of the Doctor they’re travelling with and even though there’s a joke about how rubbish she is at it in the script, Ms Bryant really doesn’t convey a sense of Davison at all well. That said, it’s the only misstep in an otherwise excellent production. Things really get going in the second half of the story, told from old Peri’s point of view. It’s helped by the appearance of Colin Baker as the Sixth Doctor (quite unusual for a Companion Chronicle, I’m told), doing sterling work as ever in these things, and the fact that older Peri is a far more sympathetic character. You can hear in her voice that all of that irritating brashness has been knocked out of her the hard way. Parts of the story were very painful to listen to, and if you know us and you’ve heard this production you will know why, but they were handled superbly by both Nev and Ms Bryant (proving here that she really can act her socks off, given the right script). Nev may be known as a comedy writer, but his ability to deliver tragedy is heartbreaking; let’s just say, I was grateful that there weren’t any dog-walkers about that morning to see my trying not to cry all over my iPod. The wrap up is cleverly timey-wimey; even though I haven’t seen the episodes to which it refers, I know enough about them to get and appreciate the way the denouement deals with a particularly thorny fan problem. Yes, the underlying story is a bit daft when you look at it closely, but then, aren’t a lot of Doctor Who stories? It’s what’s going on between the lines that makes it. I’m never going to be a big fan of Peri, but all in all, I went away glad that I hadn’t let my age-old prejudices stop me from listening. Since all we do is get wasted and talk WHO around here, this seemed appropriate. A very nicely designed vintage beer label design, based on the password combination given to Rory by the TARDIS/IDris. The artist's name is ZeroBriant. 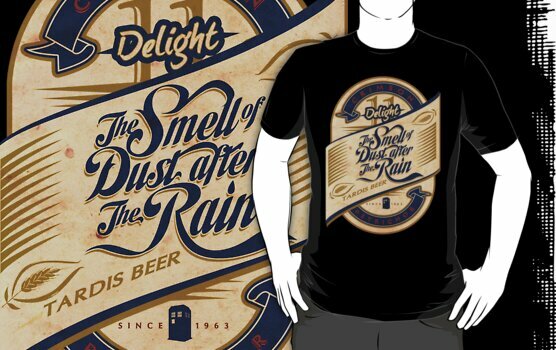 You'll find more of his fantastic and original designs over on his profile page at Redbubble. Another review episode from the new series. Almost in two halves this one, as we argue and nit-pick our way through 'The Curse of the Black Spot', and froth on about the 'The Doctors Wife'. After a masterful edit c/o The Prof we almost sound sober. Really. It's incredible. We don't know how he did it. You Always Get a Big Finish with Nick Briggs! With rediculous American hat and obligatory sonic screwdriver. As seen in The Impossible Astronaut (2011). Utterly unimaginative. The green-eyed Ood (with green orb translation device) from The Doctor's Wife (2011) (I'd rather have Idris/TARDIS, but beggers can't be choosers). Amelia Jessica Pond as per 'Eleventh Hour' 2010. First release May 2011. A limited edition exclusive 'Doctor Who Experience' junior Amy Pond with overcoat and suitcase is also (only) available at The Doctor Who Experience exhibition shop. 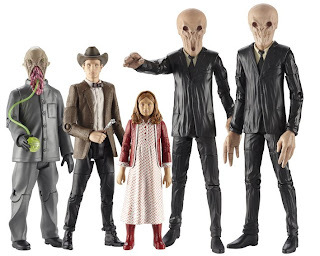 So, apart from Iris and Amy in a pirate/Dana Skully outfit, spotted any good stuff you'd like as figs in the series so far? 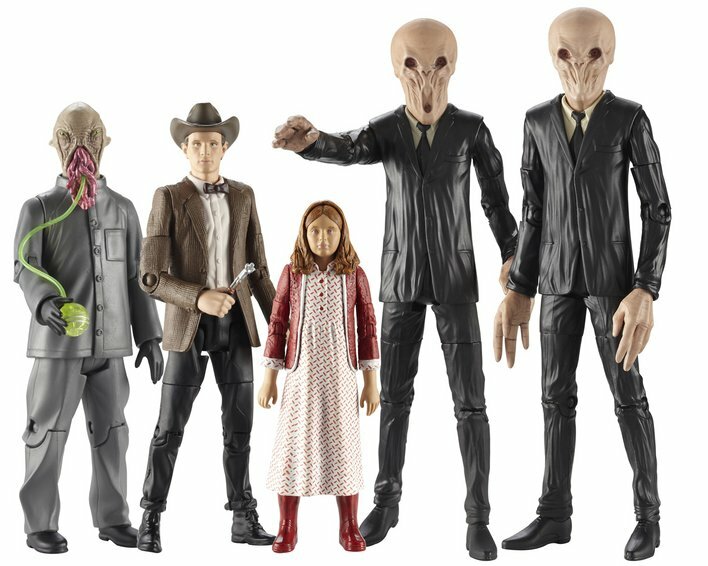 Check out this awesome new Forbidden Planet Time Monster Set (exclusive UK only, sorry) now on pre-order. 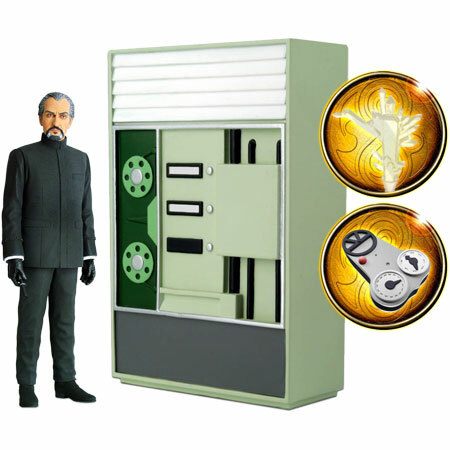 Comes with Time Scanner (technically a Pertwee accessory), Delgado Master (with TCE), Master's TARDIS 70's computer exterior, and Atlantean Crystal of Kronos thingy. Hello? Hello? Is anyone still out there? Yeah, we know, we're a bunch of lazy, unreliable, work-shy, lay-abouts who can't organize their lives enough to al be on Skype at the same time. It's a fair cop. FINALY, here's another episode (and for the new season too). Sure you've probably listened to all the reviews from all the other podcast first. Presumably this is no new news. But this a review born or Gin, excess, and obsession. As such you owe it to yourself to grab your favorite tipple, run a nice hot bath, and join in us our non-sequential meanderings through the latest offerings from Auntie Beeb. Oh, and don't forget, you can join us for daily disposable casual alcoholism and frothing about Whovian tat on our new Facebook Page - www.facebook.com/DirtyWHOers. Sputters, Lightfoot, Sen, & Fuschia. OH..see, mine didn't work because I was missing that little wooden peg. There's always a bit left over..
Added on the Who North American new TV board by Clavius (ta) here's a shot of the Junk Console Playset we discussed in the latest podcast. Designed by a Blue Peter viewer, Susannah Leah, and 'realized' by production designer Michael Pickwoad (whatever that means). Not seen a release date for this yet. Hey, it may even be an exclusive, so please let us know if you know more about this. Morgan Jeffery from Digital Spy interviews legendary fantasy author Neil Gaiman about the upcoming Doctor Who episode he scripted. I'm very excited as it sounds like they'll finally do the pocket universe idea that was used in the 8th Doctor novels. 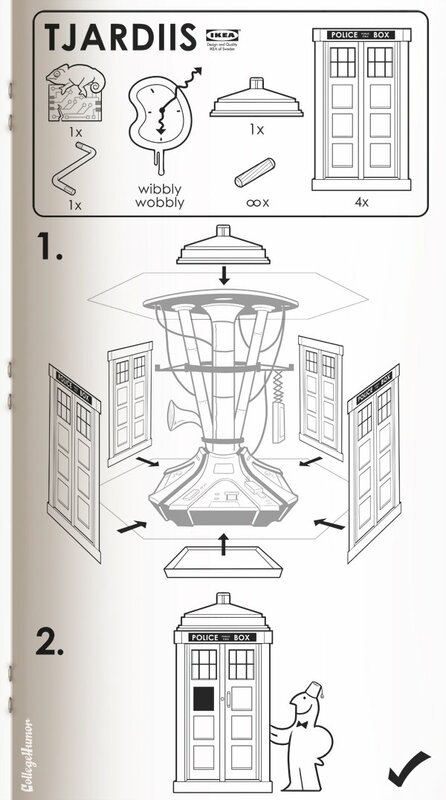 I've always thought that it was a perfect way to circumnavigate what Russel T. Davies did to Gallifrey. Pocket universes are good places to hide...things...or people. I won't go into it further, and just keep my fingers crossed. 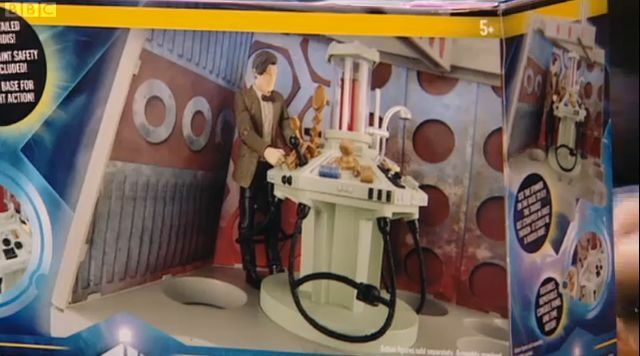 AND it sounds like we finally get to see more of the TARDIS. Had a long flight, and chance to fiddle with something vaguely artistic(ish) using Adobe Ideas on the iPad.